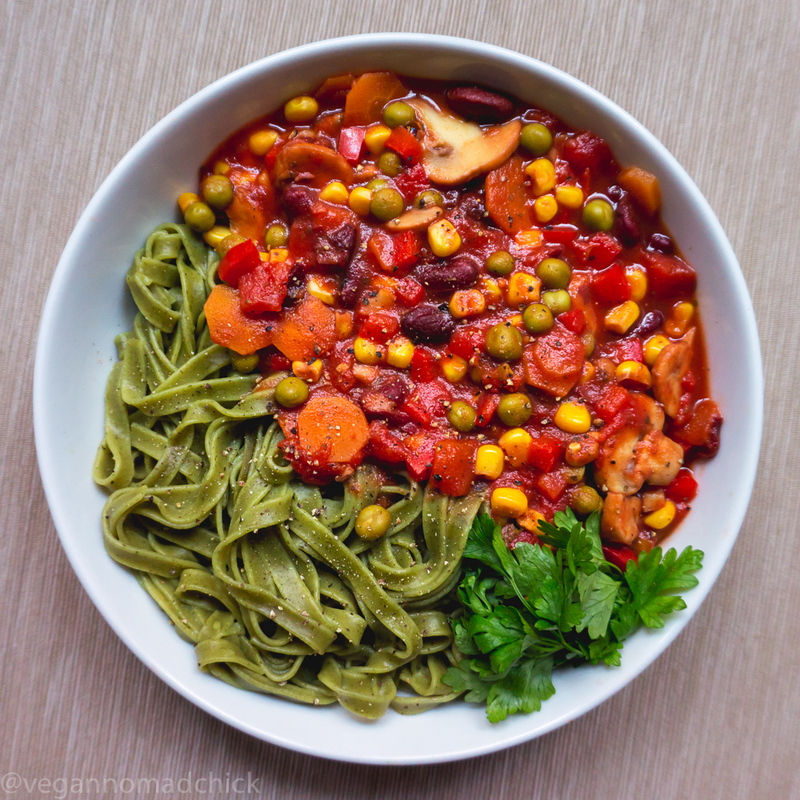 I’ve never used tagliatelle before moving to Serbia (I guess I’m a spaghetti and linguine person) but fortunately we came across a vegan spinach tagliatelle in a Maxi supermarket. The Barilla brand spinach tagliatelle is suitable for vegans because it only contains durum wheat semolina and dried spinach. Check the label of other tagliatelle pasta because it usually contains egg. 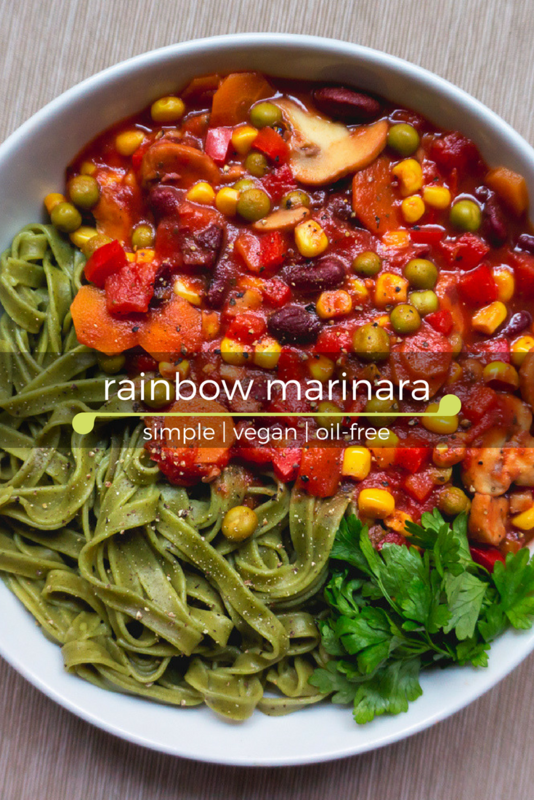 I like serving this rainbow marinara with spinach tagliatelle because the green noodles make the bowl even more colourful. 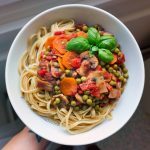 Tagliatelle is thicker than spaghetti and linguine, and super long, so they make a fun starchy addition to this bowl. If you don’t have any pasta on hand, try it over rice or potatoes. Pasta, rice, and potatoes are my favourite starch staples (in case you haven’t noticed 😉 ). These have always been my favourite foods but now I eat them with abandon and with zero guilt or worry. I fill up on these healthy carbs and keep the fat and oil at bay for more energy and effortless weight loss and management. A starch-based whole foods lifestyle is the way to go! Serve this marinara with spinach tagliatelle or your favourite pasta. Drizzle with fresh lemon juice just before eating. Heat a large saute pan (or a large pot) over medium-high heat. Add the water, mushrooms, bay leaf, herbs and seasonings. Stir well and saute for 5 minutes or until mushrooms shrink and release water. Stir in the red bell pepper, carrots, kidney beans, corn, diced tomatoes, and tomato paste. Bring to a boil and simmer for 10-15 minutes stirring occasionally (so the liquid reduces and the sauce thickens). Lower the heat slightly if the sauce starts to stick to the bottom and stir more often. Add a splash or two of water if the sauce is too thick. Just before you take the sauce off the heat, stir in half a can of peas. I like using diced tomatoes for the tomato chunks and tomato paste for a deeper tomato flavour. If you don't have these on hand, try using some of your favourite pre-made pasta sauce. Feel free to adjust the seasonings to your liking. We don't add salt to our food so you might want to add a sprinkling of salt at the very end of cooking. If your pot is large enough, feel free to toss in the rest of the canned corn, kidney beans, and peas. Why not! Loved your latest you tube video. I so enjoy following you and kuba as u go on your journeys.